Thinking about surfing the waves? 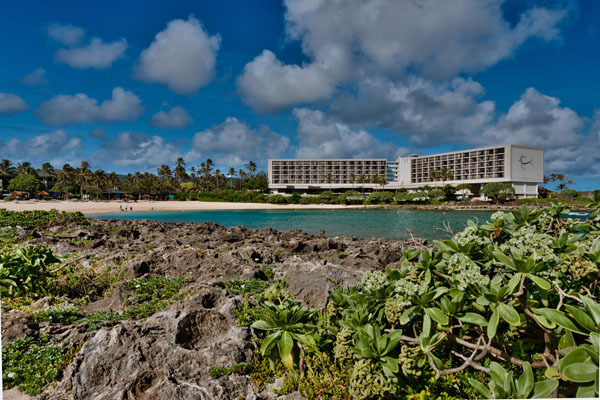 Experience a unique and authentic stay at The Turtle Bay Resort, the perfect spot to do so. Located about an hour from the touristic and busy Waikiki beach, The North Shore is considered as the countryside of Oahu. While driving to The North Shore, stop by The Dole plantation a living museum featuring the history of the Hawaiian pineapple. Get back into your car and keep driving while admiring the beauty of the speechless views of Hawaii. The North Shore offers seven miles of beautiful beaches waiting to be explored and host the world’s premier surfing competitions. 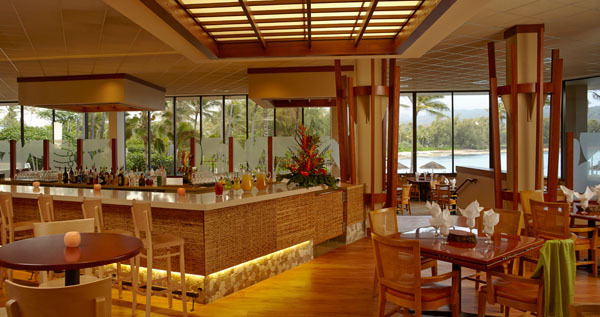 While arriving at the North Shore, experience a stay at the laidback Turtle Bay Resort. 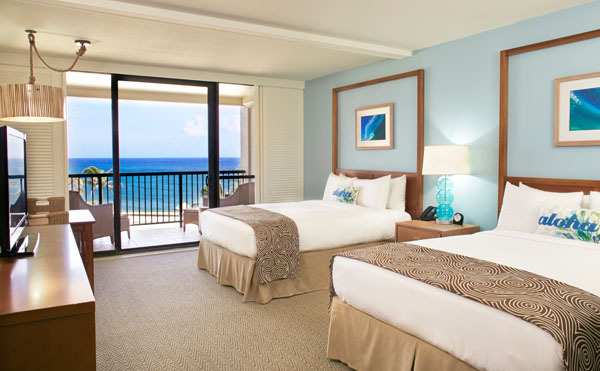 Indulge a front row seat on the Pacific from the renovated beautiful and sophisticated rooms that Turtle Bay Resort has to offer. The Resort is unique, and an idyllic location will make you feel special. It is the only resort of the island that offers such spectacular tropical landscape and panoramic views. The property is composed of 850 acres, with three wings, offering varied views of the ocean and the incredible North Shore Coast but also 12 miles of oceanfront hiking that surrounds the resort. You will almost feel like if you are on another island of its own, the perfect getaway. It is located approximately 45minutes from Honolulu International airport and just minutes from the Polynesian Cultural Center, Waimea Valley, and Haleiwa town. Select your home away from home among the selection of their 410 beautiful guest rooms and ocean view suites from 478 square foot to 725 square foot. Each room is a relaxing and peaceful environment consisting of modern and chic decor, designed with their beautiful signature touch of turquoise as a reminder of the blue of the ocean. 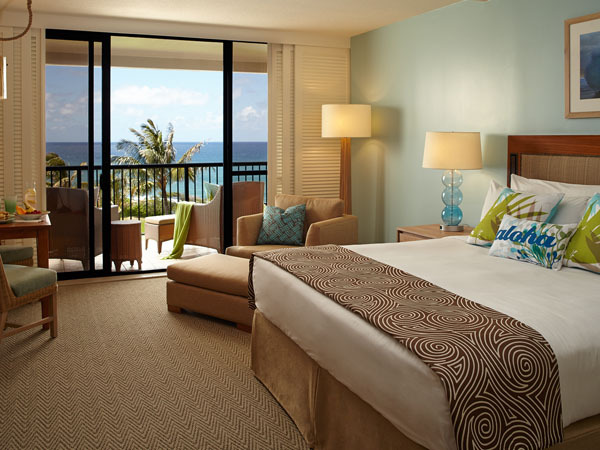 We know how tiring it can be to plan a getaway and that is something with which Turtle Bay can help. They offer a broad palette of package getaways for couples, family or friends with a wide range of activities. Guests can try to stand up paddle boarding, horseback riding and pony tours along ocean front trails, guided snorkeling tour, surfing lesson, helicopter tour, golf course sessions and more. Fans of television and cinema can also explore the set locations of the world’s most famous movies, and television shows, such as Jurassic Park, Pearl Harbor, Pirates of the Caribbean, and Hawaii Five-0, just to name a few. They can take care of creating an entire itinerary according to your preferences. You will have the pleasure to enjoy the North Shore Style dining experience with the seven on-property restaurants and bars the resort has to offer. Noted that the chefs of each of the seven restaurants only use fresh and local ingredient from both land and sea, giving the unique and exquisite taste to their different dishes that you will experience while enjoying fascinating views over the ocean. Indulge a pampering moment at Nalu Kinetic Spa, Salon and Fitness Center where you can experience a unique and relaxing Hawaiian treatment featuring the natural plants of the island.